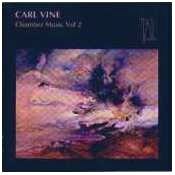 This disc features the world premiere recordings of Vine's Piano Sonata No. 2 by Michael Kieran Harvey, and of his Third String Quartet by the Tall Poppies Quartet (John Harding and Georges Lentz - violins, Esther van Stralen - viola, David Pereira - cello). Other tracks previously released on the Tall Poppies label are included here to complete this compendium of Vine's chamber music of the last decade.